For a project that seemed quite simple, I’m having quite some issues with these Dream Stripes. For one, this yarn proofs to be difficult to work with. I’ve never knitted with such thin yarn before and I’m having difficulties making out my stitches. Secondly, my edges for this project are a disaster. They just don’t look any good! 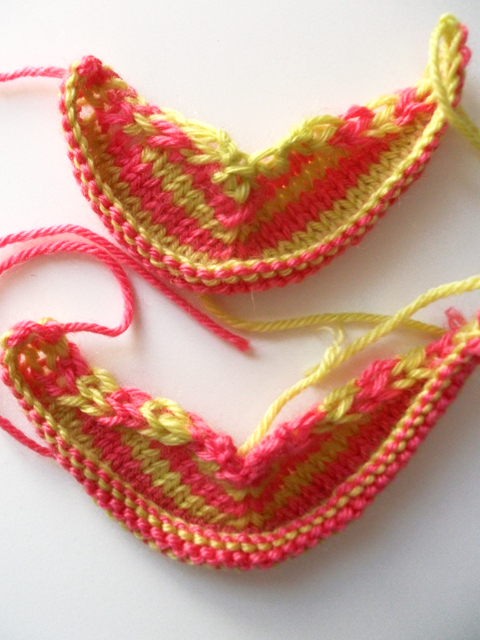 According to the pattern, you need to skip each first stitch of a row. This is a technique I have always used to get tighter edges, BUT with this project you also need to switch colours every 2nd row and that makes it pretty difficult to achieve even edges. After a number of tries to commence this pattern with my yarn of choice, I decided to first make some swatches with another, thicker yarn. As you can see, the top edge looks really sloppy and ugly. For my first couple of tries with the pattern, I just followed the instructions, skipping the first stitch of each row. In the mean time I also tried simply knitting the stitch in pattern (no improvement) and knitting/purling the first stitch in the back loop. I think that last one might be a winner, but I’ll have to practice on an even tension between the sides with and without colour switching. Do you have any other tips to achieve a neat edge for this pattern?